Visual animated presentations in the Think Bubble Mathematics series on the topic of Numbers to 20. 154 slides. Subitizing numbers ot 10 on a ten frame. Includes both rows and pairs arrangements. 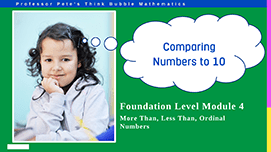 Interactive PowerPoint Think Bubble Math 002a. 154 slides. Subitizing numbers ot 10 on a ten frame. Includes both rows and pairs arrangements. 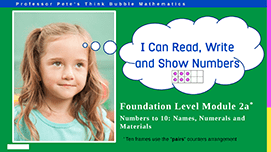 Interactive PowerPoint Think Bubble Math 002b. 110 slides. Activities include counting initially 10 objects then 20. Count on number lines to and from any number. Introduction to grouping ten into a full ten frame. Interactive PowerPoint Think Bubble Math 001.